Happy Tea for Two-sday to you! Today I thought I would talk about another teacup - though it's actually a tea set with sugar, creamer, teapot, cups and saucers. It might be a little difficult to see the colors in the picture, but the set is painted purple and gold. The insides are a pearlescent white. Very pretty! It would be a special set just for how pretty and unusual it is, but it actually belonged to my Great Aunt Catherine, who passed away a few years ago. I am honored to have it! My Great Aunt Catherine hand-painted this Bavarian china tea set while she was in high school. They had a China Painting Class! What a lost art. I think it's fascinating. She initialed and dated the bottom of each piece. The set was painted by her in 1928! I never knew this set existed or that she had hand-painted any china. A couple of my Aunts were going through her things before an estate sale a couple of years ago and called to see if I would like them to pick out something for me. This is the set they picked out and shipped to me. How special! My Great Aunt Catherine also had a book written during the her last year telling many stories of her life. I have a copy and it tells of the China Painting Class! I hope you enjoyed my little Teacup Tale today. Do you have any treasured teacups in your home? What a completely wonderful story and what a beautiful tea set. Do you use it? Or is it just for show? It just looks like it would make any tea taste better! What a beautiful set! 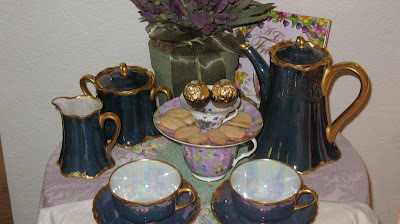 I do have some pretty tea cups & tea pots. I love them. I used to collect them more before my son was born. They are so pretty. They remind me of a bygone era. Could you imagine a "tea set painting" class being offered today! Wouldn't that be cool! That set is simply beautiful. What a treasured memory! Beautiful set! I love collecting tea cups and tea pots. I like the way you used another tea cup and saucer as a serving piece. Very nice. I love your tea set and the wonderful story. My 7 year old grandaughter and I are collecting tea sets and regularly have tea parties.